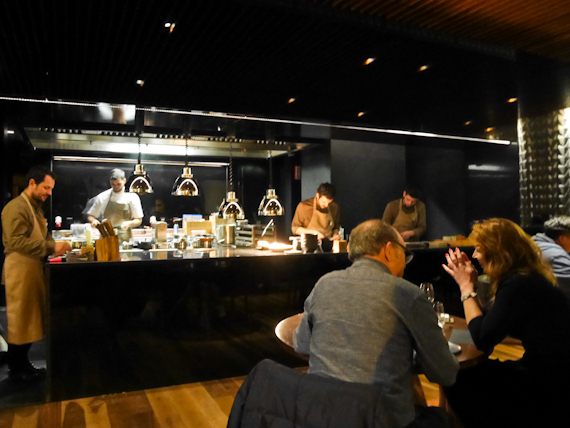 I recently attended Peixe em Lisboa, the Fish & Flavours Festival and, inspired by what was on offer, decided to investigate some of Lisbon’s Michelin Starred restaurants. At the moment, the dining scene in the city is booming, supported by a huge influx of tourists. Lisbon is also good value, compared to other Eurozone cities and you can still eat here from less than 10€. These establishments will cost substantially more but if you’re interested in high quality creative Portuguese cooking, then these are the places where you’ll find it. Open for a couple of years, this tiny intimate place has under 20 covers and just one sitting. 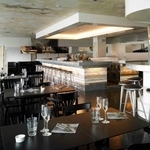 Chef Alexandre Silva has only been open two years but has already one Michelin star. The kitchen occupies one side of the space and is slightly bigger than the dining area. You see the chefs working on the food and they come out and present it to your table. It’s a nice touch and they’re best placed to tell you how it was prepared. I take the 18 Moments menu, bites rather than courses, but split into four parts – snacks, bread, mains and desserts. I counted almost twenty separate moments, all bursting with explosions of flavour, tinged with Asian flavours and ingredients. 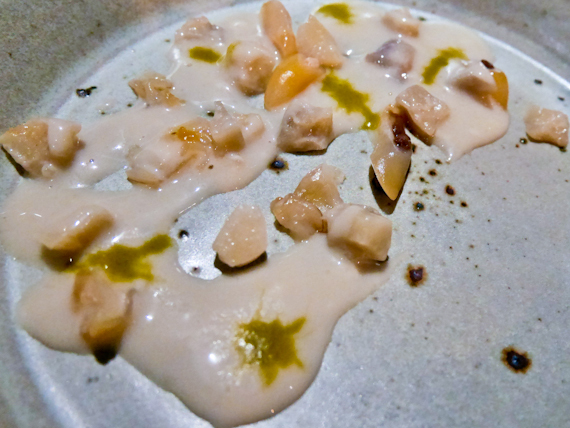 Mullet marinated in Sake, wrapped in a slice of lard and served with broth from the bones. Goose barnacles, razor clams and diced Jerusalem artichoke in a tiger nut sauce, seasoned with garum, with Thai green curry blobs. 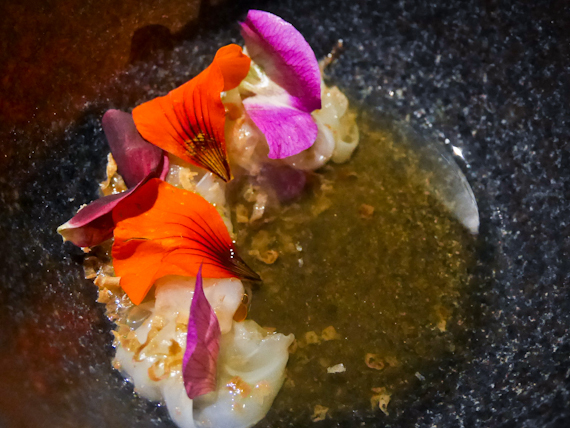 Raw baby squid in crab broth with bell pepper oil, grated dried octopus roe, garnished with flowers. The pre-dessert of cabbage sorbet with wood sorrel, good to cleanse the palate. Slightly out of town, in Belém on the banks of the river, inside the Altis Belém Hotel, this feels more like traditional fine dining. There’s a glorious view of the water and the service is impeccable. 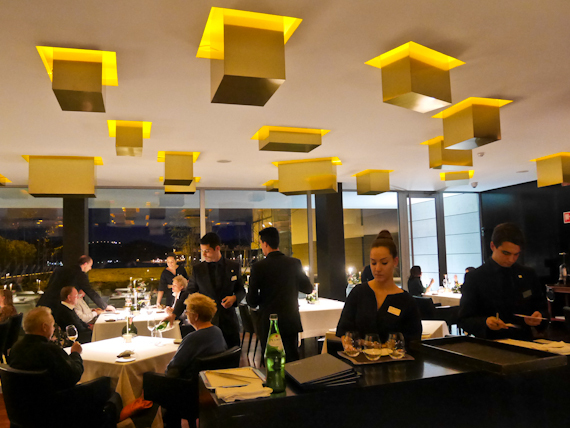 Chef João Rodrigues at Feitoria won his first Michelin star in 2011 and has held it ever since. He’s obsessed with high-quality ingredients, ranging from organic vegetables to local fish and seafood, and it shows. The food is based on Portuguese tradition but tinged with influences from all over the world. I choose his six-course menu Materia which with a selection of amuse bouches, pre-desserts and petits fours make it a lot more. There’s certainly a sense of theatre here, whether it’s the white gloved waiters handing you the designer crockery, or bringing a classic duck press to your table to squeeze out the juice from shrimp heads. 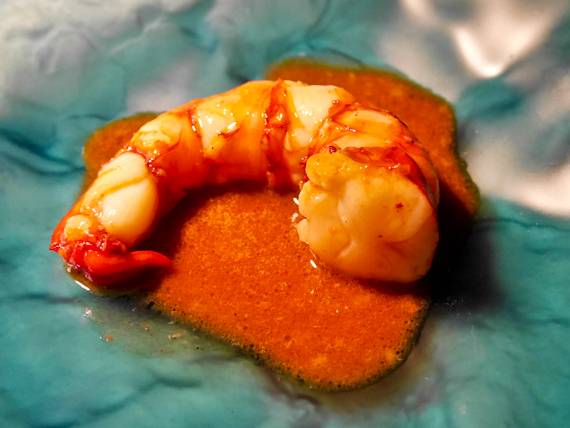 Algarve scarlet shrimp, with a sauce made from heads fried and then pressed at the table. Cockles and goose barnacles with carolino rice and burnt samphire. Turbot in fish belly broth topped with thin slices of asparagus and black caviar. 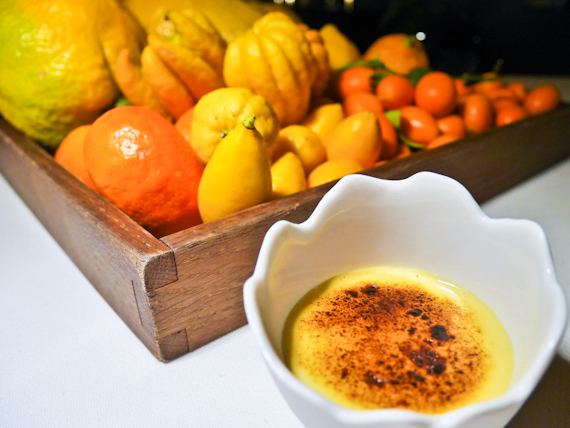 Custard cream with citrus including cumquat, hand of Buddha, mandarin and lime zest. 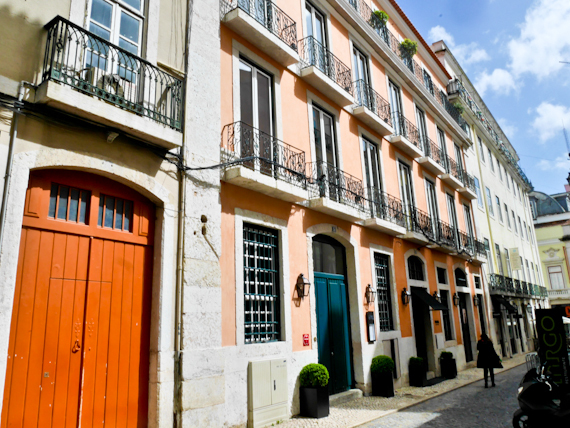 Right in the heart of the old Chiado district, in an 18th-century warehouse, Alma has just 50 covers. It’s not large but the high stone arched ceiling gives it a sense of airiness. Bottles of wine cover one wall with the semi-open kitchen peeping out in the corner. 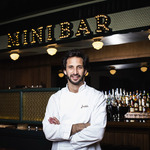 Chef Henrique Sá Pessoa has one Michelin star and he’s another chef mixing Asian influences with traditional Portuguese cuisine. 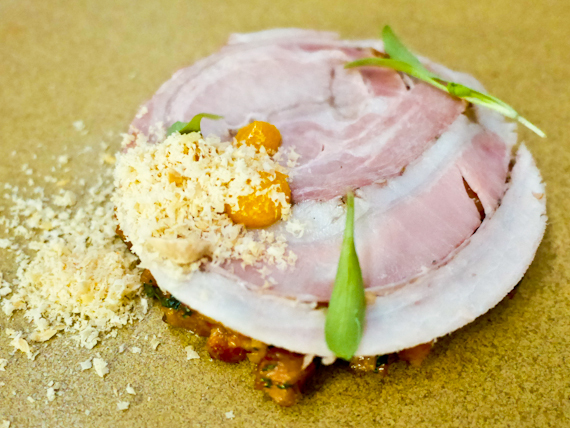 His dishes are a well-balanced combination of flavours, subtle yet finely defined. This is a place where you can feel comfortable, the service unassuming yet quietly efficient. In the middle of the meal, the chef comes out to mingle and answer questions about his cooking. 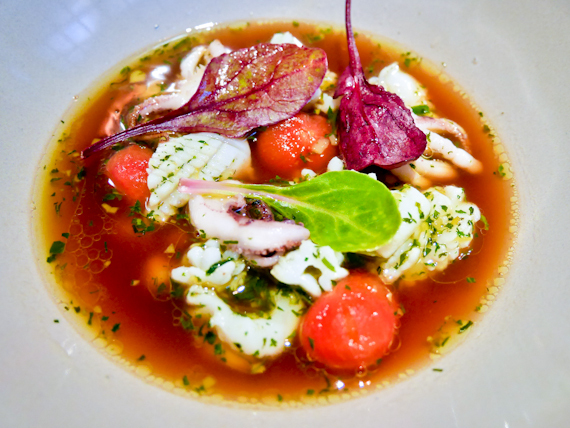 Baby squid with chickpeas, tomato confit, baby chard in squid and chicken broth. Grilled rare Mackerel slices on thin Melba toast over diced red peppers with aubergine puree and blobs of tomato gel. Scallop ceviche with tiger milk, topped with cucumber slices and dehydrated quinoa, plus blobs of guacamole and thin slices of chilli. 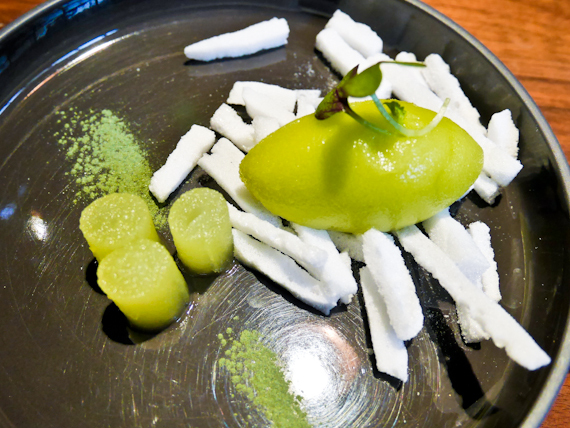 Basil sorbet with granny smith apple cylinders and meringue matchsticks. 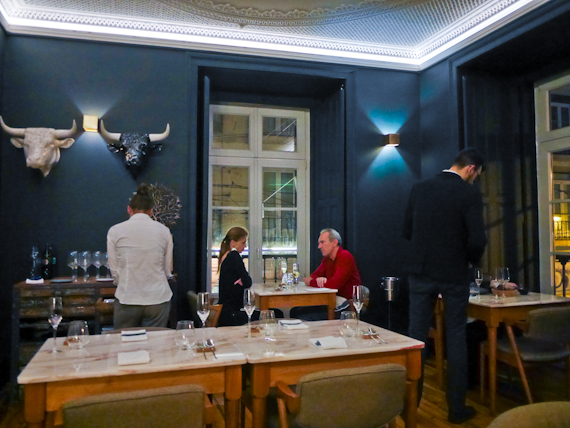 Also in the centre of Chiado, on the 2nd floor of the Hotel Consulat, Chef André Magalhães has just opened his new venture. Already wildly successful with his A Taberna da Rua das Flores, this is his stab at fine dining. The building is the former Brazilian consulate, and the décor takes you back to colonial days. The cosy dining room has indigo coloured walls decorated with contemporary art and the windows look out onto Luis de Camões Square. You eat off marble-topped tables on handmade designer crockery and service is informal but attentive. The set menu changes every day, according to season and inspiration, and there’s no choice. A selection of amuse bouches is followed by an appetiser, fish course, meat course and a couple of desserts. Bread is sourced from locally from an artisan baker and served with tomato butter. 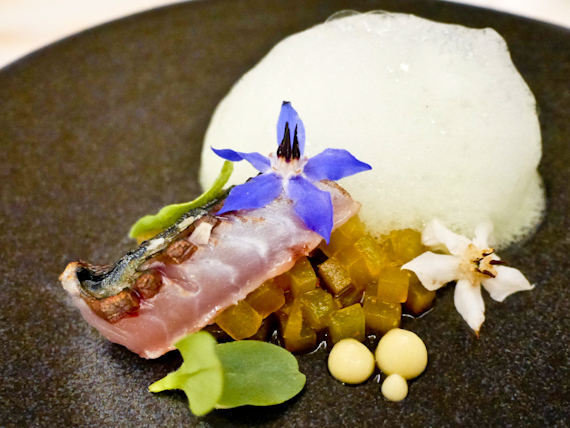 Blue Mackerel on diced pickled cucumber, topped with cucumber foam, with fennel puree. Diced black pork, topped with belly slice, smoked yolks and coriander sprigs. Croaker baked inside bread with celeriac finger and puree with rosemary. 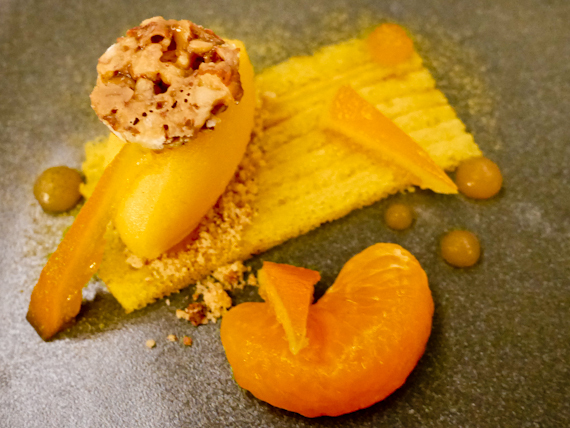 Orange tart with mandarin ice cream, topped with almond biscuit, with grapefruit gel and kaffir lime powder. 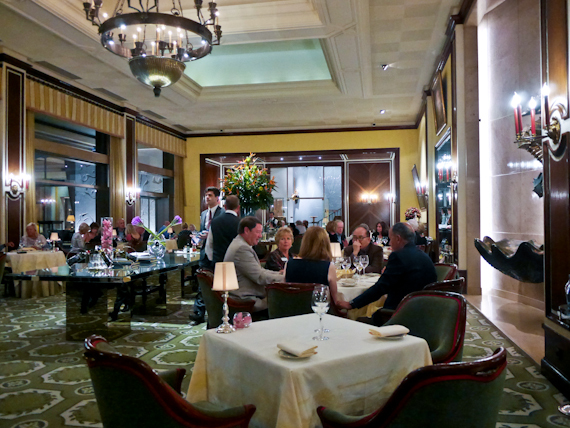 Inside the Four Seasons Ritz Hotel, Varanda restaurant doesn’t have a Michelin star but it feels like it should. The décor is grand, all crystal chandeliers and huge flower displays with gilded furniture. Chef Pascal Meynard is originally from France but has been cooking here for ten years. His cooking is classic French but with Portuguese touches. This is a pleasant space to eat and there’s a glorious view of the sumptuous gardens through the huge windows. I go for the four course Discovery Menu but, as usual, amuse bouches and desserts make it far more. I also substitute the meat for fish, as I’m keen to get the French take on Lisbon’s finest. Algarve octopus, topped with caramelized pearl onions, glazed saké shimeji mushrooms, miniature broccoli plus blobs of beetroot gel. 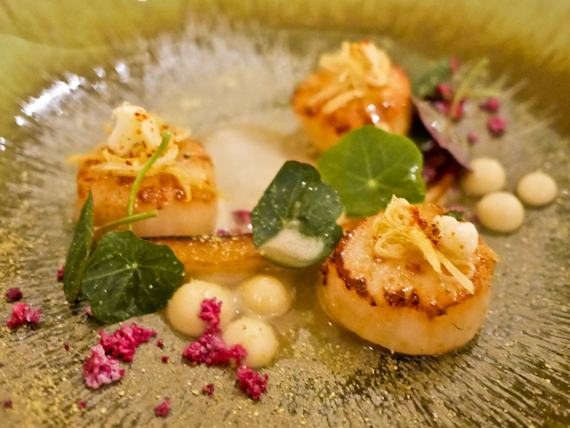 Scallops with a ginger lemon confit, girolles, cauliflower mousseline and roasted parsnip batons with kaffir lime. Seabass marinated in lemon and myrtle, topped with clams and sea asparagus. Sudachi cream, moulded and coloured like a lemon, on pennyroyal granita. 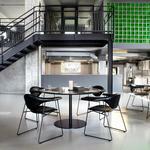 Loco – 18 Moments menu, 96€. Feitoria – Matera menu, 105€. Visit Lisboa has information about the city. TAP Air Portugal flies direct from Heathrow and Gatwick. The Gatwick Express is the fastest way to get to the airport from central London.